The modest Nuvole light by Vistosi fits harmoniously into different interior designs, but is also characterised by a playful detail. The round and slightly curved shade is made of multi-layered glass. Hand-crafted, fine, round indentations in the glass make this layered structure become visible and are also an eye-catcher, which shapes the lights distinctive character. 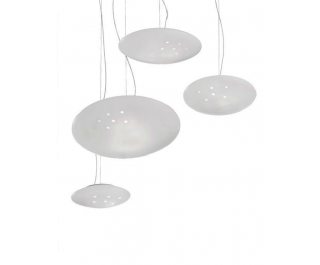 The light is available in various sizes and can be chosen to suit every room size.